Dear Everybody started as just one letter, a man apologizing to a woman for standing her up — the man wondering if they had gone out that night, if they might have had a happy life, if maybe his whole life would have been different. I didn’t know then who was speaking or that it was going to be one of a series of suicide letters. But I did have a distinct voice, a particular way of speaking and a particular way of thinking. That one letter led to a rush of about 100 letters — Jonathon Bender apologizing to nearly everybody he has ever known. A couple of weeks after that, there was another rush of another 100+ letters and I had the spine of the book – Jonathon’s life and what happened to him. I learned about Jonathon Bender and his life in much the same way the reader does, letter by letter. I didn’t plan the novel out or outline it any way. I always try to let a novel tell me what it is going to be. After I had the organization, I added the obituary, the eulogy, and the last will and testament. After adding those framing elements, the novel opened up for me in a new way. I realized that I could include anything. I added the mother’s diary entries, conversations with people from Jonathon’s past, the psychological evaluations, encyclopedia entries, weather reports, yearbook quotes, to-do lists, a mixtape, and other sorts of documents that fill in the parts of Jonathon’s life that he can’t tell us with his letters. The different documents seemed to give the novel more texture, more layers, to fill it out with story and fill it in with feeling. Writing a novel made up of 349 short pieces allowed me to deal with difficult material (abuse, mental illness, suicide) that might have become sentimental if handled as traditional narrative. And I found that writing in the form of letters allowed me to put huge amounts of story into the novel. Each letter is its own story. Writing Dear Everybody was a continual process of discovery, the novel continually unfolding and also becoming more complex. For the longest time, I felt as if I had this big secret. Sometimes, I would look out the window and wonder if anybody knew yet what I was doing. It’s a great feeling and this was especially so during the revision process (though it also alternated with feelings of disgust, which is another part of the revision process). 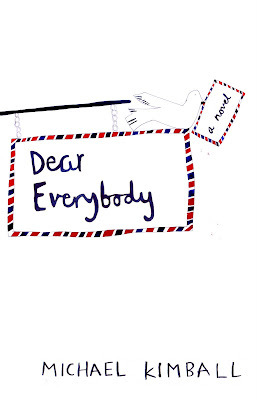 I rewrote every piece of Dear Everybody. Nothing is the same as what I started with. I threw a lot of material away. There is easily another 50K words that didn’t make it into the finished novel. The revision process is endless, until the book goes to the printer, which, thankfully, it eventually did. Michael Kimball’s third novel, DEAR EVERYBODY, was recently published in the US, UK, and Canada (http://michael-kimball.com). The Believer calls it “a curatorial masterpiece.” Time Out New York calls the writing “stunning.” And the Los Angeles Times says the book is “funny and warm and sad and heartbreaking.” His first two novels are THE WAY THE FAMILY GOT AWAY (2000) and HOW MUCH OF US THERE WAS (2005), both of which have been translated (or are being translated) into many languages. He is also responsible for the collaborative art project--Michael Kimball Writes Your Life Story (on a postcard). "Dear Everybody" sounds like a gift--to Mr. Kimball and everybody else. For me the stories that come as gifts are the most exciting and demanding. It's only happened to me a few times and those are the stories I love. And I think I love other writers' gift-stories the best, too. This fits with Stella's percentage chart. Rarely and but wonderfully a story starts with inspiration, a great rush of it. The work one does after that determines everything.